RTK.Redact enables reviewers to automatically propagate redactions to duplicate documents without running custom SQL scripts. By propagating redactions to duplicate documents, review teams can ensure consistency between a standalone copy of a document that is disclosed and instances where this document is attached to different emails. 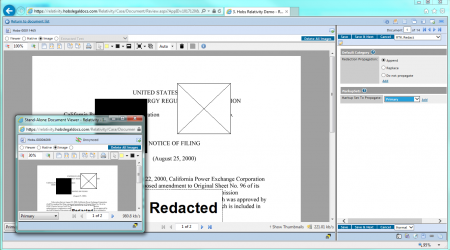 Reviewers can append, replace, or preserve redactions for duplicate documents. RTK.Redact also detects redaction inconsistencies between duplicates, so review managers can easily identify documents requiring remediation.